How Modern Conference Room Chairs Are Critical To Your Business? Are you giving your meeting space a professional makeover? Well, you should consider investing in modern conference room chairs that cannot just be building up aesthetics, but also aides in improving the functionality, comfort and efficiency of those work in there too. Why do you need modern conference room chairs? You furniture should be comfortable, beautiful, convenient and aesthetically appealing in your work place. Conferences chairs are often designed for productivity. Generally, these chairs roll over wheels with fixed arm rests, but there are also options other than that available in the market. They come in a variety of materials such as leather, vinyl, mesh or fabric with vibrant range of designs to suit ergonomic needs as well for those using it for prolonged periods. More than decor, office furniture make an impression on your clients; the way staff perceive your standard of work and much more. So there is great importance in choosing the right set of conference chairs that can appeal and be efficient in day-to-day work life. They may not be luxurious as executive chairs, but they often are made out of thoughtful designs to give comfort and looks. Enhancing aesthetics: Modern meeting room chairs are simple, sleek designs that are easy to maintain with good durability. They enliven the space they occupy with their touch of style and elegance, lightweight, sleek design using metal or other finishing. Improving appeal: Modern office furnitureis constructed in extravagant manner with vibrant colors with an aura to bring in positive energy to the environment it occupies. Better comfort: In order for work to proceed smoothly, comfort is of utmost importance. No matter how long you work, comfortable seating arrangements provide better efficiency, thus improving productivity. 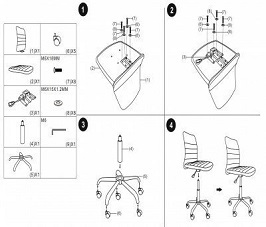 Equality: The right kind of office furniture will bring in equality among employees without any differences. Affordability: Compared to traditional furniture, modern furniture come with better quality and cheaper rate. Modern conference chairs also come with certain disadvantages. Though they are cheaper, some manufacturers incorporate cheap materials to bring down cost, thus affecting durability. Also, despite the love for being current, there are instances when people you do business with prefer certain things to be old school. Not all office chairs are comfortable and they may not suit all types of professions as well. Why Are Modern Conference Table Chairs Better? Modern conference table chairs are a great way to create a bold impression to your clients during their first visit itself. An upbeat design will keep it fresh in their minds and reflects the business’ modern mentality and fresh thoughts. But overall, choosing modern conference table chairs should be considered carefully depending on your industry and what you stand for. 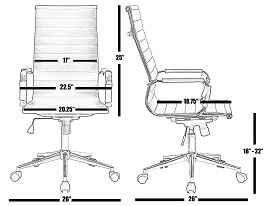 Keeping the Conference Room Chair Modern, what does it mean? These conference room chairs being modern means that they are often affordable without much compromise on quality and durability. They come in a wide range from around $50 to around $500 or even more depending on how much you want to invest. 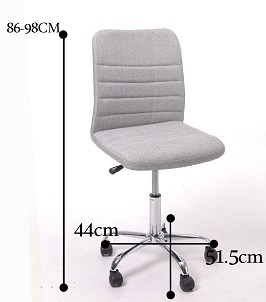 The right chair would be something that suits your industry, work style and office space. Times are changing, but many offices are still to change their conference room chairs modern. These chairs are the future of modern age offices and are made a vital part of businesses across the globe. They come in different types: high-back, mid-back, mesh-back, ergonomic, with handle, without handle, etc. Here, we are having a discussion on the most popular types of chairs. 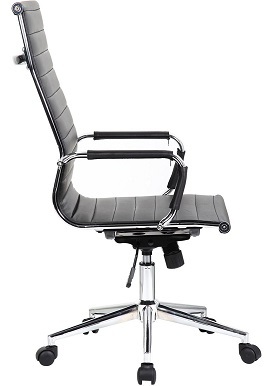 This is one of the black modern conference room chairs without arms. They come ribbed and designed in black which suits any professional space. 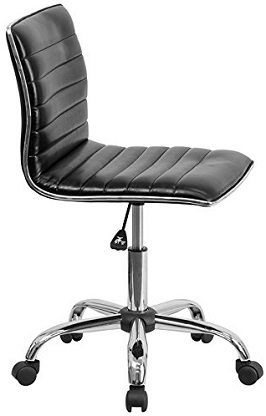 With its elegant design on contemporary leather, mid-back construction, foam molded seats and back support surrounded by chrome border and a relaxing swivel function, this chair make work easier. 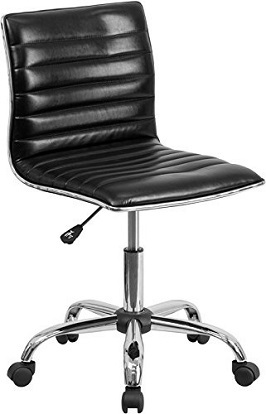 These black modern conference room chairs have adjustable seat height, dual casters, soft leathery upholstery with polyurethane added for extra suppleness and durability. The chair has a lightweight design of around 20 pounds and dimensions of 18 x 21.5 x 31.25 -36 inches with capacity of holding up to 250 pounds. 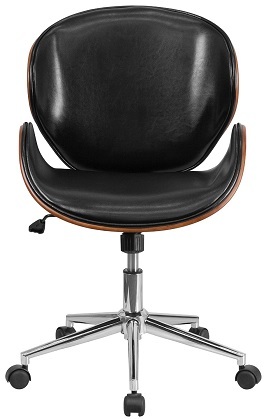 Flash furniture mid-back black modern conference room chairs are great looking, good quality chairs. But there had been mixed opinion regarding its leather covering. They are adequately comfortable and clients often like the cosmetic appeal. Since it does not have ergonomic design, user often faces the feeling of falling off the chair unless used to. Overall, great looking chair with great looks and adequate comfort. 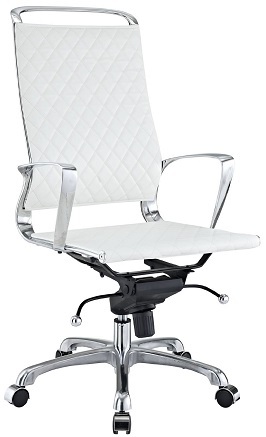 What makes this perfect is the white modern conference chairs with its chrome frame, reclining feature, five dual-wheel casters to suit any floor and tension knob provided for tilting control to adjust your back tilt as per your body type and posture. Add panache with its elegant style, diamond patterned leather cushioned seats and back. This white modern conference chairs works well with smaller and bigger spaces alike. If you are looking for some vivacity, these are the chairs you should look for. They come with dimensions of 19 x 26.5 x 38.5 – 41 inch. For a chair over $200, this is a good looking chair with nice functionality. As per customers, this white modern conference chairs are great looking, firm, heavily built and beautifully designed with ideal comfort and proper height adjustment options. There are few who are not well adjusted with the durability, but are quite impressed with make and design. The Offex BT-9826M-BRN-GG is a mid-back brown modern conference room furniture with a ribbed and upholstered leather structure. The chair uses chrome frame on which foam and leather covering makes a beautiful pattern in brown to give the professional outlook. 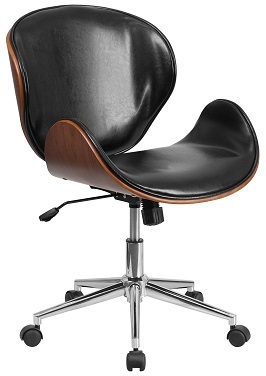 The leather is clubbed with polyurethane for added softness and enhanced durability. The chair weighs around 40 pounds and has dimensions of 23.5 x 25.5 x 36.5 -39.5 inches. The seats offer lumbar support and there is mid-pivot knee tilt, dual paddle controls, jacket hanger at the back and pneumatic height adjustment options. 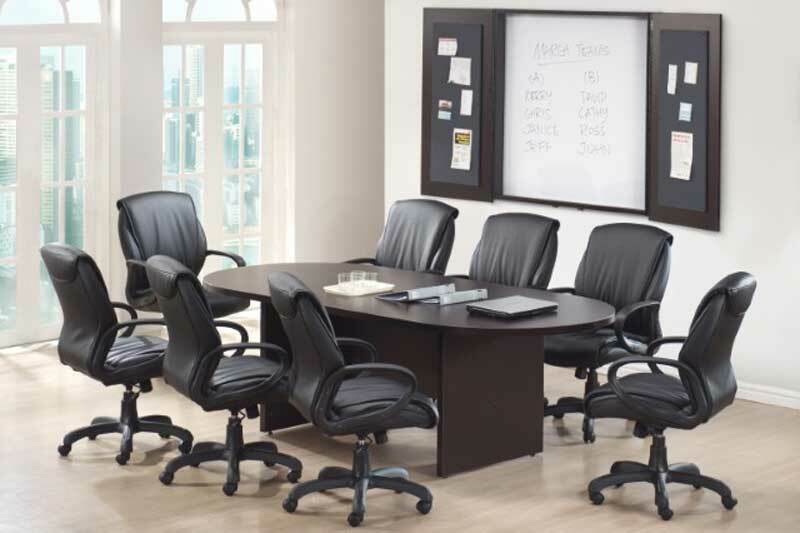 This brown modern conference room furniture has matte finish and is very soft to touch. Customers had the concern that material used is not leather since it had a cheaper look as opposed to the price it is tagged for. The lining of the edges also had been reviewed to have a cheaper look. 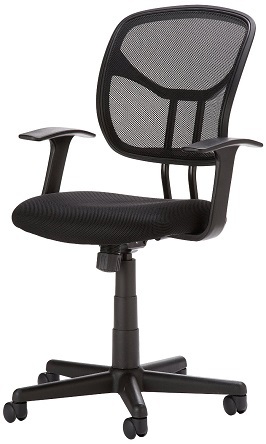 If you are looking for an ergonomic chair, AmazonBasics mid-back, modern conference room chair is worth checking out. Being a reasonably priced piece of furniture, this makes a great addition in enhancing the appeal with its stylish beauty to your office setting. 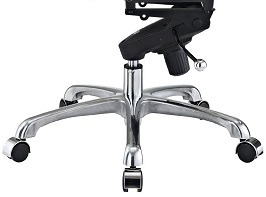 It has a contoured mesh back, pneumatic height adjustment, padded seat, pneumatic controls, ergonomic design, tilt tension knob, dual wheel casters and maximum of 225 pound capacity. The chair is durable and has dual wheel casters and comes around the dimension of 25.2 x 24 x 35.6 – 40.3 inches. Arm rests does not have height adjustment option. 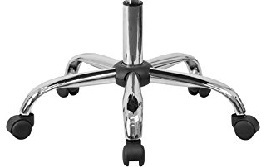 AmazonBasics is a comfortable mid-back, modern conference room chair that provides great back alignment. As per customer reviews, the product is amazing, but if you experience lower back support, you might have to add a pillow for adequate comfort. 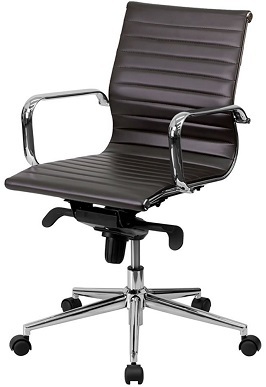 Otherwise, this chair is great for the price, smooth, comfortable and professional by all standards. If ever you look for a decent looking chair within the range of $50, look for GreenForest mid-back, armless, ergonomic chair. 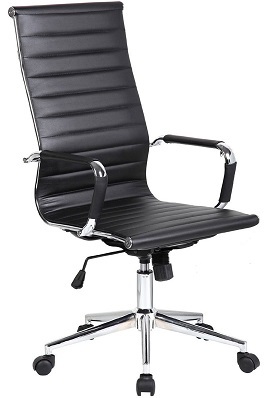 This is one of the best cheap modern conference chairs that could adorn your office space with its modern, fabric upholstery, stylish design and provide sufficient comfort with its thick padding on seat. There are five caster wheels placed on chrome base that adds to convenience and durability. 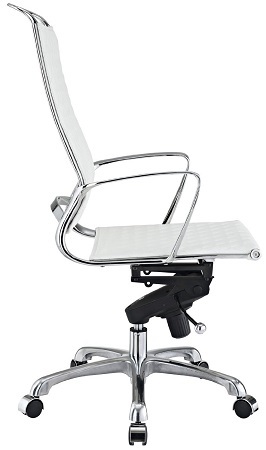 The chair has capacity of up to 300 pounds and 360oswivel seat with pneumatic control. It will fit any office space with its dimensions of 18 x 21 x 35 -40 inches and weighs around 13 pounds. GreenForest customers have rated these as ergonomic chairs as great, cheap modern conference chairs that are appealing to eyes and are equally comfortable. The fabric is also appreciative with decent look and overall elegance that is great for such a price tag. 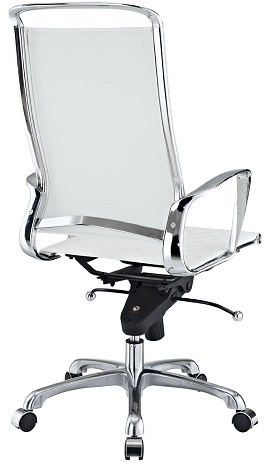 2xhome Executive Office Chair is a great buy if you need modern conference table chairs with casters. The brand is quite known for supplying quality products at affordable price. This office chair has ribbed structure upholstered using PU leather which makes it extra comfortable for prolonged seating. There are armrests that are leather covered. 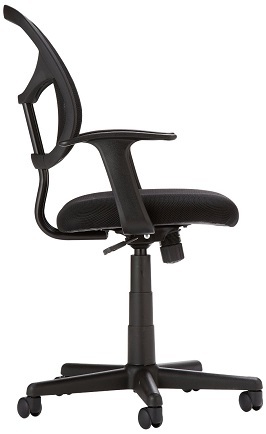 This chair height can be adjusted as per user’s requirements with a tilt tension knob for controlling the tilt for up to 20 degrees. 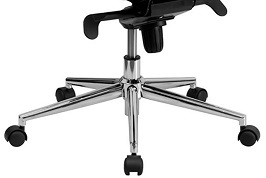 The base support is made of chrome with five wheel casters. 2xhome modern conference table chairs with casters had mixed reviews from customers. They look good, but it might get uncomfortable for prolonged use due to unpadded armrests. Also, the chair has gassing which might fade off with time. Despite that, they offer value for money. If you are looking more for a contemporary style modern chair, Flash Furniture natural wood makes the best modern conference room chairs. 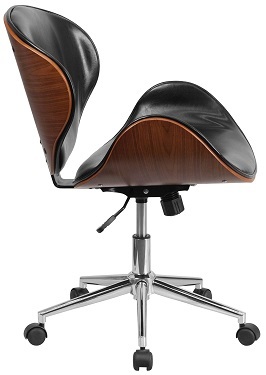 They are made of natural bentwood upholstered with glossy black leather. This is crafted to make a lasting impression and optimal comfort with firm back support. 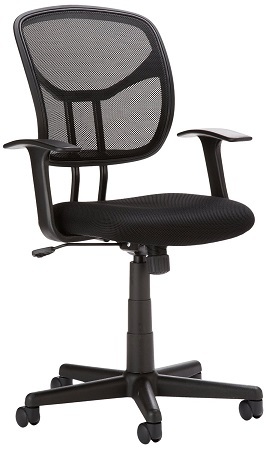 This is a mid-back chair with 360 degree swivel to utilize available workspace. The design also holds tilt tension knob and pneumatic adjustments. The entire structure weighs around 31.8 pounds and has dimension of 26 x 21.5 x 32 inches. 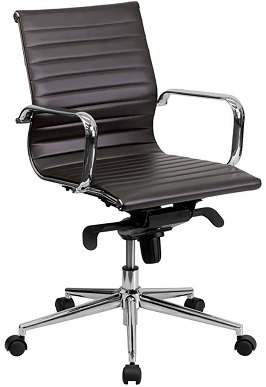 Flash furniture conference chair is one of the best modern conference room chairs in the market. As per customers, these chairs are good of quality and looks, but could scratch easily. Otherwise, this is a good chair that performs for its price.